The compact dimensions of the racy Velo mean Andy dwarfs it somewhat. In three capacity classes – 250, 500 and 750cc – the stipulation was that they should be machines that ‘Joe Public’ could buy in their local showroom. This was met with wholesale approval by most of the British manufacturers and on June 10, 1967, nearly 50 riders and their machines came to the start line. Unlike the other classes, the production race featured a Le Mans type start and riders were flagged off all together, with five minutes between the different capacities. After the 750 twins blasted away it was the turn of the 500s, but as the smoke cleared two riders could be seen trying to kickstart their bikes into life. The pair – Neil Kelly and Keith Heckles – had little experience in starting their highly tuned Velocette singles but with the help of some ‘magic spray’ into the carb’ manifold, they eventually got them fired up and set off in pursuit of the pack, which by this time had long since disappeared. 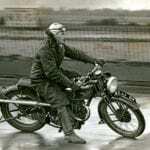 As history records, the two specially prepared Thruxtons proved to be many miles an hour quicker than the opposition and at the end of the three hard laps, Kelly won the 500cc class at an average of 89.89mph – passing through the speed trap at the Highlander at an impressive 129.9mph – on the Reg Orpin-entered bike, with Heckles on the sister machine, sponsored by Geoff Dodkin, second. Although from the outset the ACU had stipulated that the machines entered in the production class had to be those ‘readily available’ in the showrooms, controversy surrounded both the 250cc class-winning Bultacos and Kelly and Heckles’ Velocette Thruxtons. 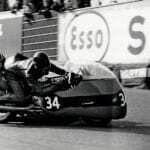 Certainly, the rules had been dramatically ‘bent’ by Hall Green in providing ‘production’ machines to select dealers with engines that had been specially developed in a bid to win the TT that year and were very different to those on the standard road-going 500cc singles. Both of the bikes ridden by Kelly and Heckles – and a third ridden by experienced TT racer Arthur Lavington – used ‘squish’ combustion chambers with specially shaped forged pistons while the Orpin/Dodkin motors had a host of internal improvements including needle roller bearings on the cam followers; all of which combined to produce an extra 4½bhp over the standard Thruxton. Kelly’s victory would be the last one for Velocette in the Island but as history records he was lucky – on two counts – to even make the start. 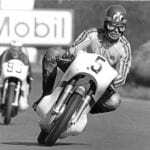 Originally the Orpin machine had been allocated to winner of the 1965 Manx GP, Dennis Craine, but two weeks before the TT Craine had crashed in a scramble and in the ensuing melee was struck by another rider – Neil Kelly – and suffered a broken arm. Now without Craine for the TT, Orpin offered the production race seat to Kelly, but it wasn’t the end of the drama for the Manxman. Kelly had already competed in two TTs, but before the 1967 production race had not completed even a lap of practice. Firstly, the Hall Green single prepared for his sponsor was late to arrive, forcing Kelly to practise on a borrowed MSS. Sadly this developed all sorts of mechanical problems including a badly slipping clutch, which saw Kelly grind to a stop at Quarry Bends. It was here – if period anecdotes are to be believed – that an elderly farmer came to the rescue by producing a large nail from his pocket to adjust the clutch and get the Manx racer moving again. But while kicking the MSS back into action, Kelly was passed by the ‘roads open’ car and his hopes for a complete practice lap were dashed. By not completing a lap Kelly assumed he wouldn’t be allowed to start and went to his work on race day. But this was interrupted when he received an urgent phone call from his pit crew informing him that if he could make it to the start line in time, he could race. The factory-prepared Thruxton had arrived, been scrutinised and the officials had been persuaded that as Kelly was an experienced Island rider with six Manx GPs under his belt, he had a proven record and it was important to have a local star in the race. Our test subject this month isn’t either of the bikes ridden by the two former TT stars and it doesn’t have a famous racing provenance, but on most points it is a very close clone of those ridden by Kelly, Heckles and Lavington in 1967. 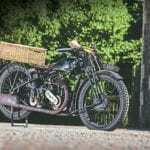 This Velocette is owned, and has been prepared to its impressive specification, by West Country enthusiast Colin Archer. Colin is passionate about his Velos and as you can probably guess I needed very little persuasion when he invited me along to take his racer replica for a spin. However, before I fired the big single into life, Colin told me a little about the bike’s history and the many hours his friend John Paynton and he had spent setting up the squish band engine. It might have been something new for Bertie Goodman and the race enthusiasts at Hall Green, but as history records the concept was one that had been developed and perfected by Polish engineer and former Spitfire pilot, Leo Kusmicki, in the early 1950s. Postwar, Kusmicki initially joined Norton as a cleaner, and when some of his ideas came to the attention of Joe Craig he later joined the race shop. Anecdotal reports would suggest Kusmicki was the brains behind much of Norton’s racing success but he didn’t get the credit he deserved and to most people his name is now virtually unknown. Although Velocette had withdrawn from road racing in 1953 to concentrate on its new LE, the big singles were still popular in Australia, where a host of clever and innovative engineers had picked up on the concept of the squish band. Through trial and error the Aussie tuners discovered that their engines produced significantly more horsepower with a marked reduction in ‘pinking’ under load than the standard Thruxton unit, that they also ran cooler and when road tested they returned a staggering 75 miles per gallon. 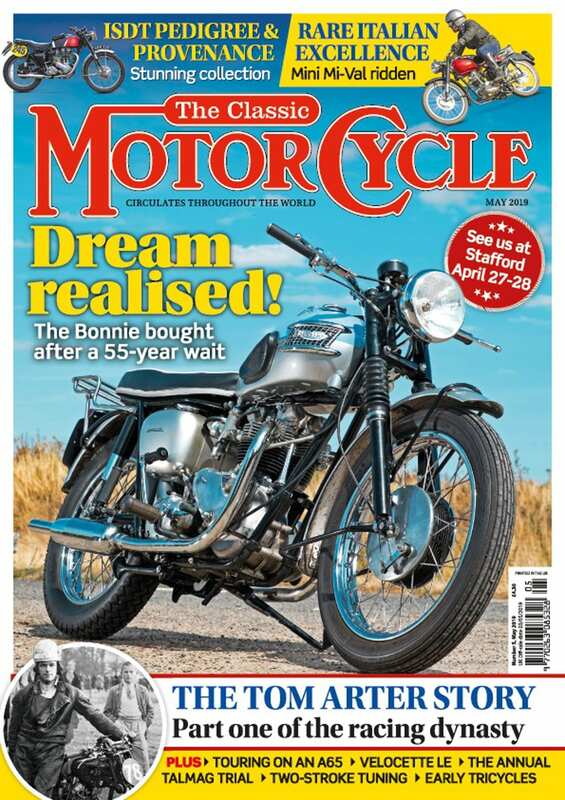 Delighted with the results one of the Australian engineers – Dennis Quinlan – contacted Bertie Goodman at Veloce and shared with Goodman many of the technical tuning details he and his team had done to their very quick 500cc single. 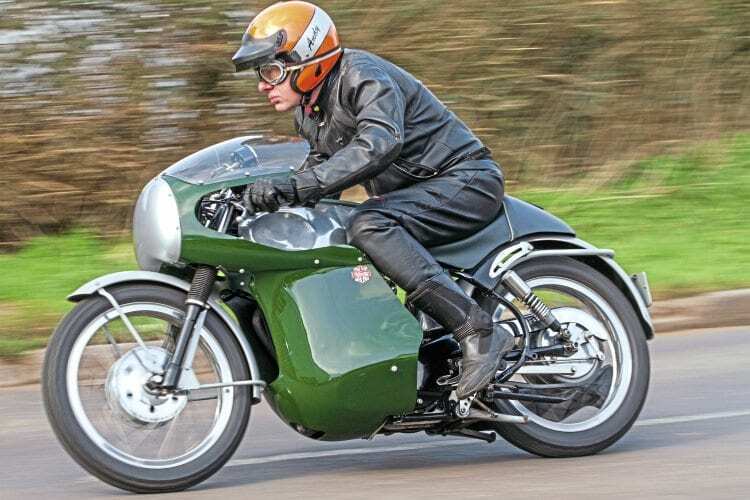 A racing enthusiast to the core, Goodman – who had supported Velocette’s amazing 24 hours at 100mph at Montlhery in 1961 – was not slow in identifying that the extra 4.5bhp that the squish band engines produced would give his bikes a distinct advantage over the opposition in the 1967 Production TT. It wasn’t possible to inspect the Australian heads as they were 12,000 miles away on the other side of the world, but Norton Manx ones were easily available for inspection and Goodman had special pistons forged to the Norton pattern, which were then mated to modified Thruxton cylinder heads. Five decades on, Colin Archer didn’t have the luxury of having Manx cylinder heads to help him with his quest to develop his own squish band replica, but I think both Dennis Quinlan and Bertie Goodman would be very impressed with both his persistence and the quality of his workmanship. During my visit, Colin gave me enough technical detail to fill an article but sadly we will have to satisfy ourselves with an overview of his many hours of trial and error before he eventually reached his goal. 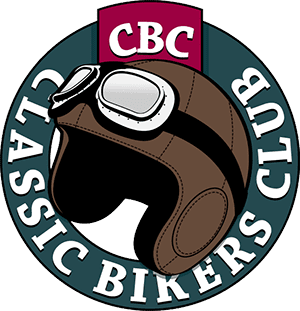 “Through the owners’ club I discovered my bike had been originally supplied to Anderson and Wall in the Somerset town of Bridgwater on January 1, 1960, and sold later that year to a Mr W J Savage who lived in nearby Axbridge. I know nothing of its subsequent life but when I bought it the rolling chassis had been lying in a back garden for a number of years with just an old tarpaulin to keep the weather at bay. Thankfully it had been painted in blue Hammerite so although it looked decidedly tatty, there was not too much rust to contend with and with it stripped back to the bare metal the frame, swinging arm and brackets were all shipped off to be powder coated leaving my engineer friend John Paynton and I to sort out the engine. “To begin with we were working a bit ‘in the dark’ but though the owners’ club we were put into contact with Nick Payton, who had once worked as a mechanic for Geoff Dodkin on the original bike ridden by Keith Heckles. The information we received from Nick proved invaluable. “I had the head overhauled by Criterion Engineering at Bishopston near Swindon and while this was being done I managed to track down a 500cc alloy barrel on the internet. To get the squish band working effectively requires a very tight tolerance between the piston and the cylinder head and over the course of two months or so John and I spent countless hours in his workshop. To make it work, we had to create cutaways in the top of the piston, so to find out where it touched we put a thin layer of Plasticine on it and I lost count of the amount of times we took the barrel and head on and off; I could probably now do it in my sleep. Sadly piston number one was lost through over machining the cut away – not good as £100 each – but thanks to the guidance John and I received from Nick, we eventually plumped for a .035in clearance on the squish band and with a 8.75:1 compression ratio, the mark two engine ran like a Swiss watch. “Working in the evenings I guess it probably took three or four months to get it properly set up but from its first brief road test the end result was nothing short of phenomenal. 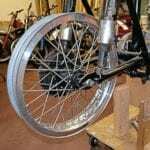 “On the running gear, I overhauled the front forks and was lucky enough to source a genuine alloy tank; this was sold to me on the understanding that as a memory of its competition heritage I didn’t remove the large dent where the clip-on had smashed in to it following a spill on the race track. “Initially I thought that I would have to fork out a large sum of money to have a replica full fairing made but I had a fantastic stroke of good fortune when I saw one advertised. The guy selling it had bought it brand new from Seymour’s in the 1960s but after putting it on his bike decided he didn’t like it, removed it and for the last 50 years the fairing had been left gathering dust in his attic. Through Trevor Smith at Sprint Manufacturing I learned that it was one of 16 especially made for Seymour’s and it proved to be a real find. Finished in its distinctive racing green and silver grey, the big Velo is a real headturner and as I was to discover the way it goes is more than a match for its stunning good looks. Lubricated by straight 50 oil on a cold morning it’s not the easiest engine to bring into life but by following Colin’s instructions I soon had the 500cc single fired up and once warm it quickly settled into a reassuring and even tickover. First gear is quite high and needed a few revs to be dialled in to get it moving and, with the tight fitting fairing, it’s not a bike for three point turns, but the Yamaha R1 clutch is a revelation, with no slipping or dragging. Once free of the built-up area, the race replica really came into its own; the squish band engine is hugely responsive to just a whiff of throttle and with its pin-sharp handling and braking it’s all too easy to see how with a pair of top-class racers in their saddles the two works-prepared bikes ran away with the 500cc class in the 1967 TT. Colin has done a superb job in building his replica and it’s a fitting reminder of the day in June nearly 50 years ago when the bikes from Hall Green took on and beat the best in the world.